16 Clues and Buried Treasure! Anyone familiar with my site knows that I love setting up treasure hunts. 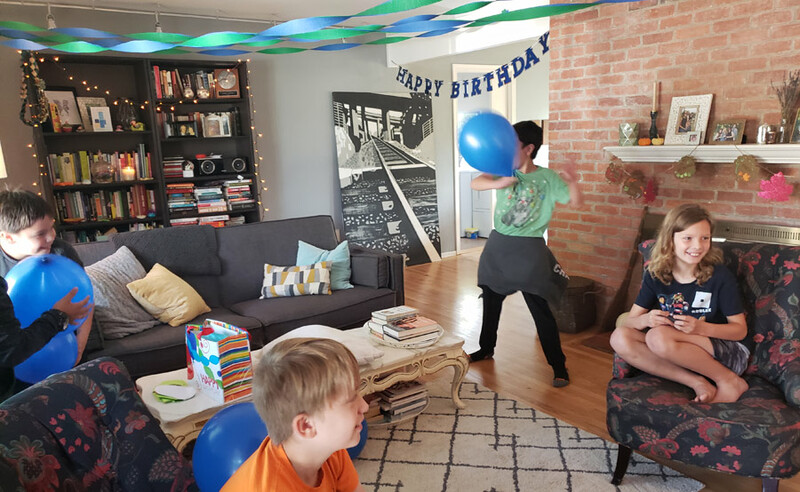 I set up another one for my son's 11th birthday party. Last year I nailed together a simple wooden treasure chest. It was strong and it would have been tough to open without the key (or the combination). This year I reused the box, but applied a dark walnut stain to give it a slightly new appearance. 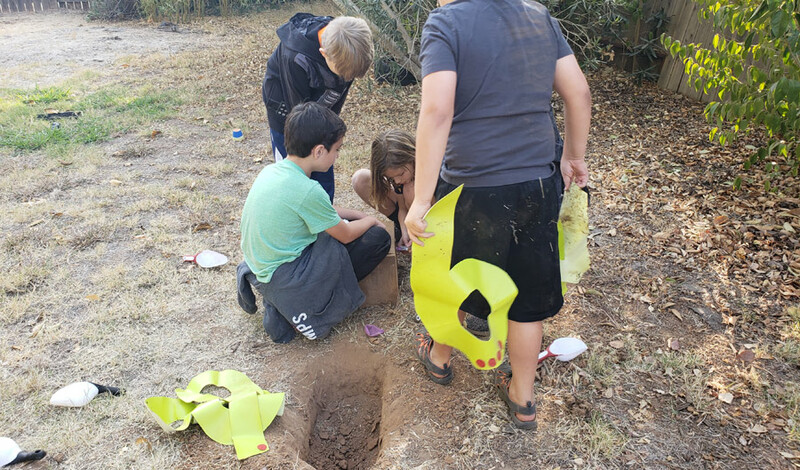 The best part of making a treasure hunt is burying an actual wooden chest. 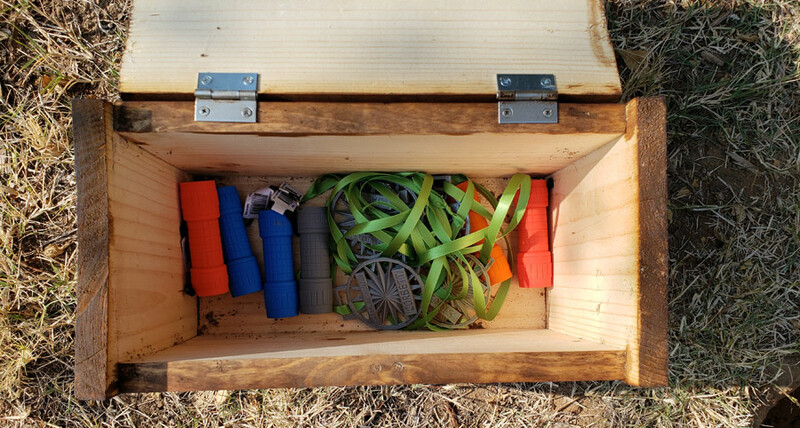 I have always loved watching that moment in movies, where a group of treasure hunters finally strike their shovels on the wooden lid of a buried box, and it is super fun to create that experience for kids. I needed to bury the chest a few days before the party. 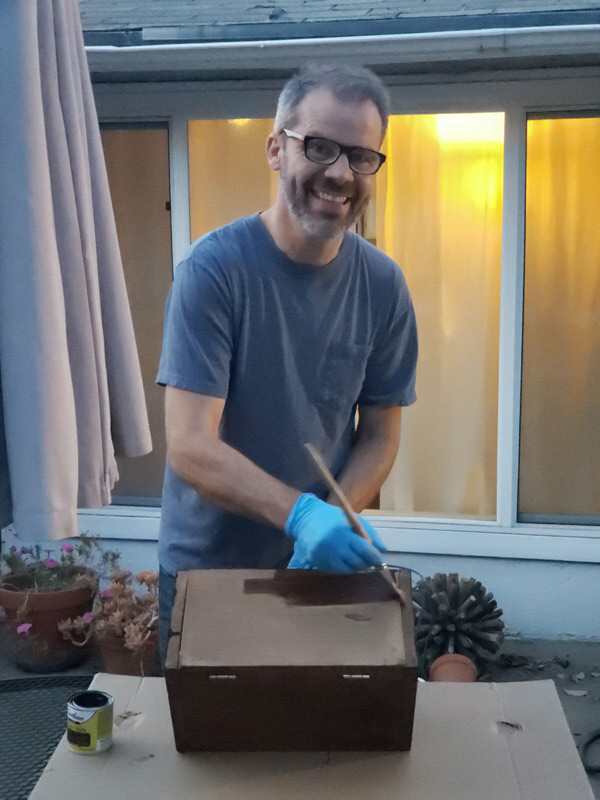 The soil in the backyard was incredibly hard, so I was digging for almost an hour to get this damn box below the surface. As I was digging this deep hole, I realized that a better shape for the chest would have been four inches tall. 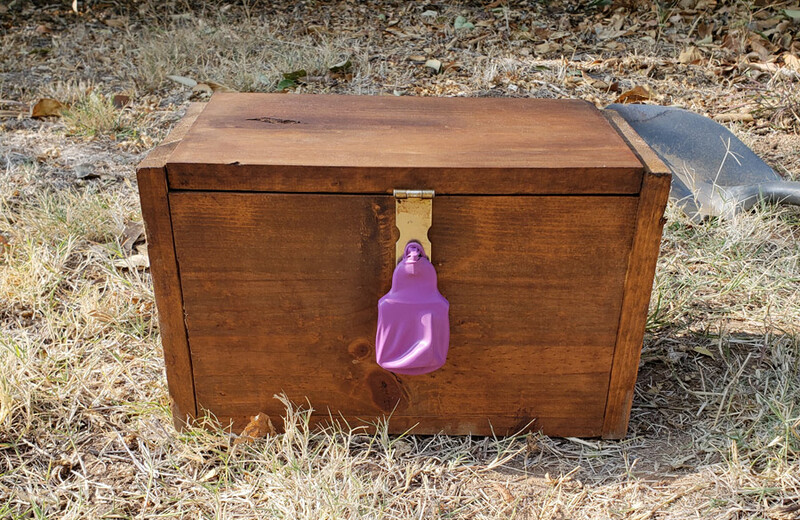 I use a rubber balloon to cover the lock, so that sand and dirt won't get into the mechanism. 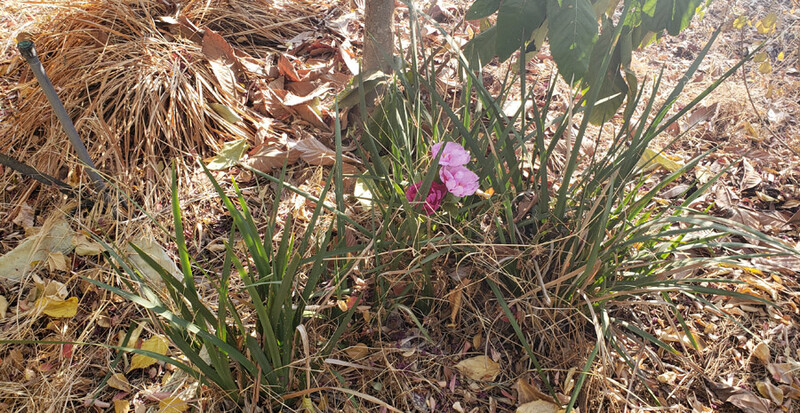 The soil was dry down to nine inches, so the disturbed soil didn't reveal itself with a darker color than the surface dirt. 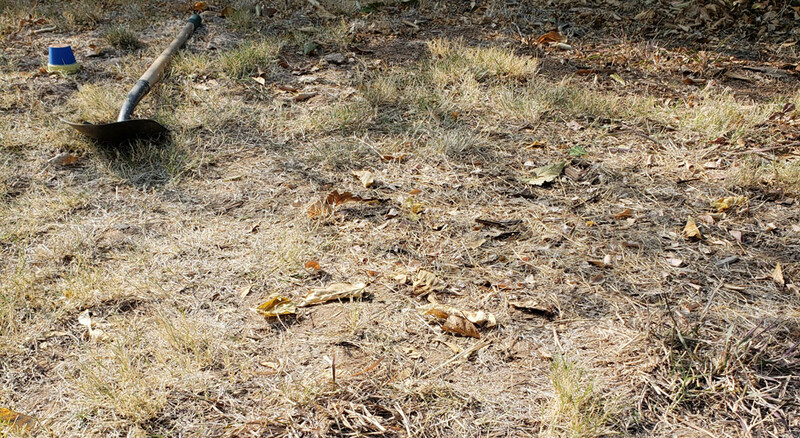 Look at this dirt, you would never know a chest was buried here! 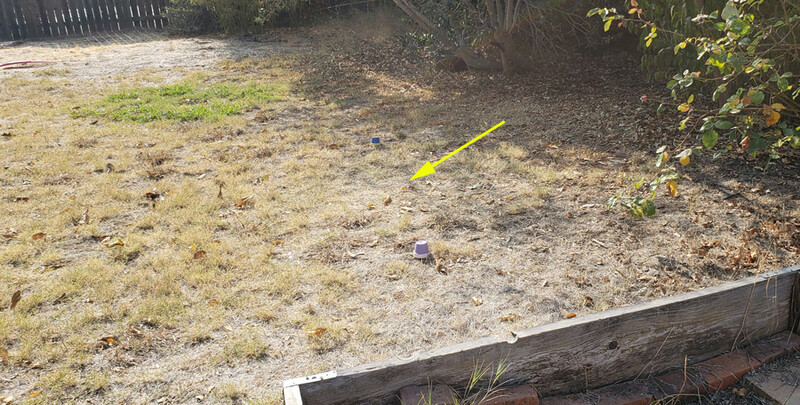 There were no visual clues to find the buried chest, so I marked the spot with a small stone marked with an X. Not every clue needs to be magical, but I try to hide some interesting ones. 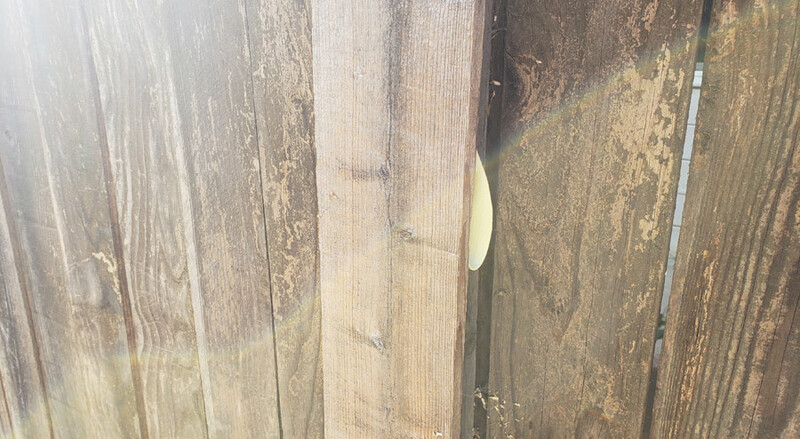 I tried something new with a fence post. The center picket was on hinges, so it would swing open like a cabinet door. This was like a bargain version of the "rotating bookshelf" you always see in Scooby Doo cartoons. A clue was also poking out of the side, to make it a little easier to spot. 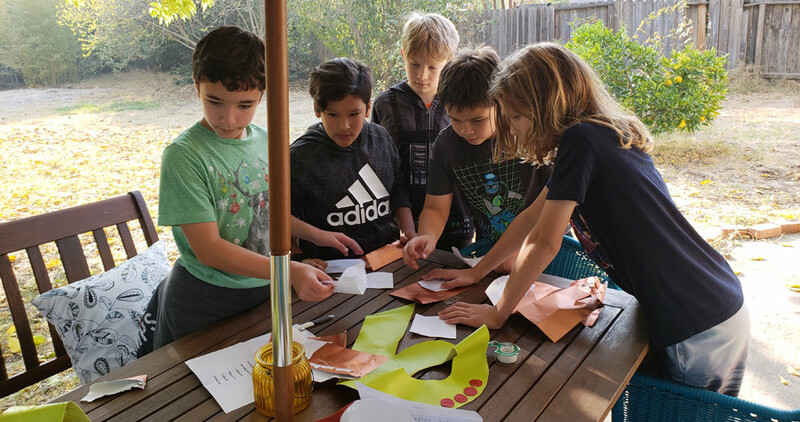 The kids were advised that ALL of the clues were in the backyard. One was technically inside, but visible from outside. 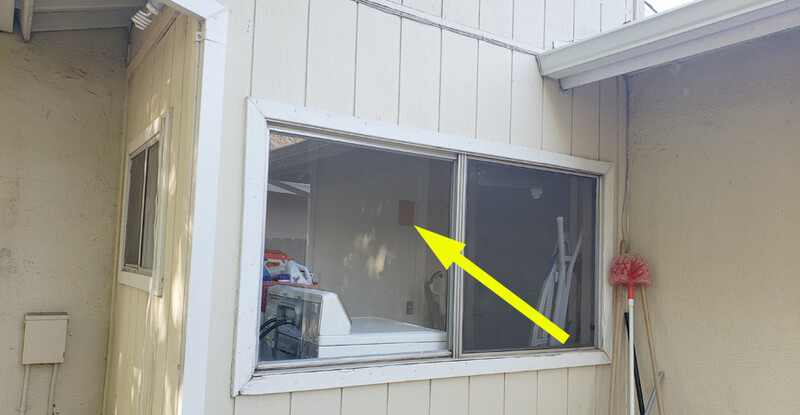 Clue was described as "behind glass". 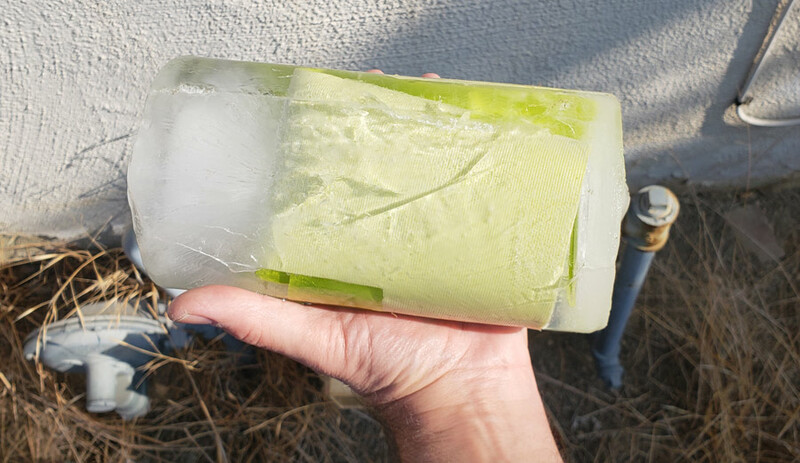 Encasing a clue in ice is one of my favorite tricks. This was a green vinyl number folded into a wad and frozen into a block. The clues were printed on strips of paper and wrapped in metallic envelopes. MURRAY, THE AUTHORITIES KNOW ABOUT THE TREASURE. DESTROY THE CLUES IN THE COOKER. 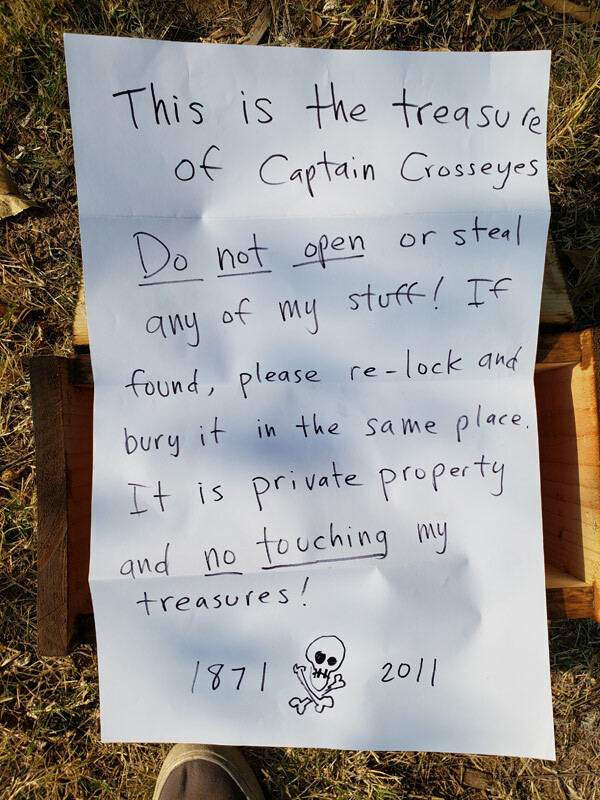 - CAPTAIN C.
That's all the story I usually need for a treasure hunt. The list of clues was in the oven. The microwave oven. It led the kids into the backyard. From the list of short clues, the kids tried to find all the parts of the treasure hunt. There were eight parts of a map and four parts to the lock combination. Fake flowers marked one piece of the map. After a few clues had been found, the puzzle came together on the backyard picnic table. Sometimes all of the kids want to be together, taking each clue in order and finding each piece of the map. Sometimes one kid would stay back at the table with the list of clues and try to figure one out on his own. Some parts of the map. As you may have realized, the whole adventure is ruined if the kids can't find the treasure, so I tend to hide the absolutely neccessary parts of the map and lock combination in more obvious locations. The kids are always really excited to start digging, even if they are only 50% certain they are in the right place. The small 'X' rock helps with that. On a five-kid dirt-removal project, having a full-size shovel is a recipe for disaster, so I gave them plastic scoops. The scoops were ineffective in the dry soil, but they left with all of their fingers intact. The treasure chest was wedged into the hard earth in a way that made it surprisingly tricky to extract from the hole. Maybe I'll put handles on it for next time. But after some struggles, they got it out of the ground! The combination lock was a minor obstacle. They had all the numbers, but had to try out all of the permutations before hitting on the correct order. Snap! And it was open! A note inside helps with the story line. I've decided it isn't important to have a valuable treasure inside the box. It's mostly just a souvenir to remember the hunt and victory. A jumbo bag of Reese's peanut butter cups, camping flashlights and medallions. 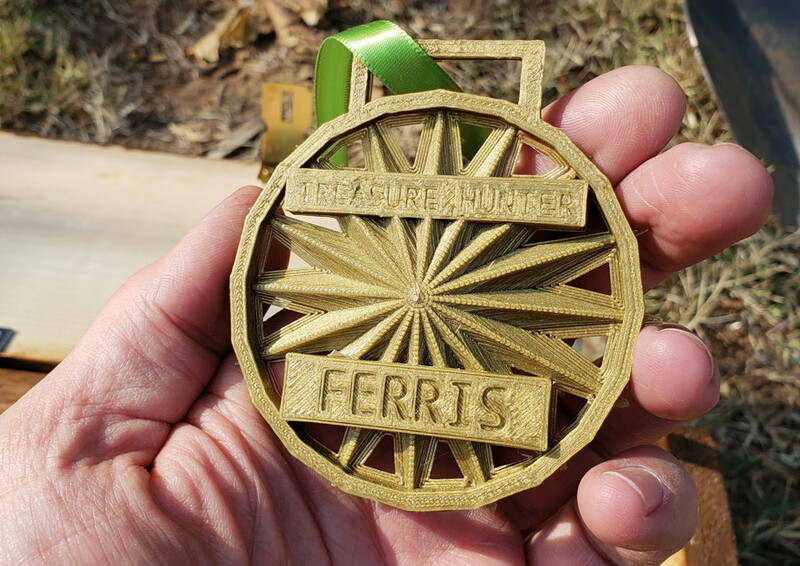 This year I included 3D printed treasure hunter medallions. 3D STL file here. Eleven year-olds are still at the age where they will immediately wear any kind of amulet that they earn. Enjoy the video. It is loud.